A little nervousness before you present your speech is actually a good thing. That adrenaline rush surging through your body is what gives you energy and enthusiasm to deliver your message with a bang. The way that you interpret this anxious feeling will determine how you handle it on stage. Think about it – fear and excitement are really the same sensation. But only one of them is thought of in a positive way. By transforming fear into excitement, you can use your nervousness to your advantage. This tip is first because if you don’t take the time to prepare for your presentation, nothing else after this will help you much. Being prepared means knowing your material in and out. Have you given yourself sufficient time to practice? Have you internalized the material to the point where you could easily pick up where you left off if interrupted? Did you rehearse the speech in front of the mirror so you can see your gestures and expressions? Solicited feedback from loved ones? In my experience, many people put the necessary effort into creating their speech, but don’t invest enough time into preparing to deliver it. Don’t skimp on preparation! It’s no secret that many Olympic athletes use visualization to help them perform at their peak. They imagine themselves at their event, incorporate all of their senses to totally absorb the scene, and envision the sweet taste of victory as they come out on top amongst the competition. Visualization is also a very powerful technique when it comes to public speaking. See yourself standing before the audience…you’re feeling relaxed as you confidently deliver the information the audience has been waiting for…heads are nodding in agreement as audience members attentively listen to you…applause erupts around the room as you conclude another successful presentation. This is just one example, but you get the idea. You have to see yourself performing successfully in your mind’s eye first before you ever approach the stage. Plan to arrive at your venue location early instead of waiting until right before you’re scheduled to talk. Ideally, you’ll want to check out the room before guests start strolling in. This will allow you enough time to familiarize yourself with the surroundings you’ll be speaking in. You’ll also have the chance to meet and mingle with audience members in advance of your speech. They’ll feel like friends and not strangers, which will add a level of comfort once you’re up there in front of them. Do you have a routine in the morning that starts your day off on a positive note? Some people read an encouraging daily affirmation. Others may exercise or pray. Whatever it is, it is something that gets you mentally and physically ready for the day ahead. It’s also good to have a pre-speech ritual that puts you in the right state of mind before you speak your first word. Motivational speaker Tony Robbins’ ritual involves “waking” his body up by jumping up and down, pumping his fists, bouncing on a trampoline, and spinning around. You don’t have to go to these lengths, but activities like these are great for both firing you up and literally helping you shake off any nervous energy you might have. The simple act of smiling to yourself as you’re waiting to go on stage is something I like to recommend as well. Science has shown that smiling is actually beneficial for us; it helps minimize stress-inducing hormones like cortisol and boosts endorphins, which calm the nerves. Reciting a favorite inspirational quote that tames the butterflies in your stomach may also be helpful. 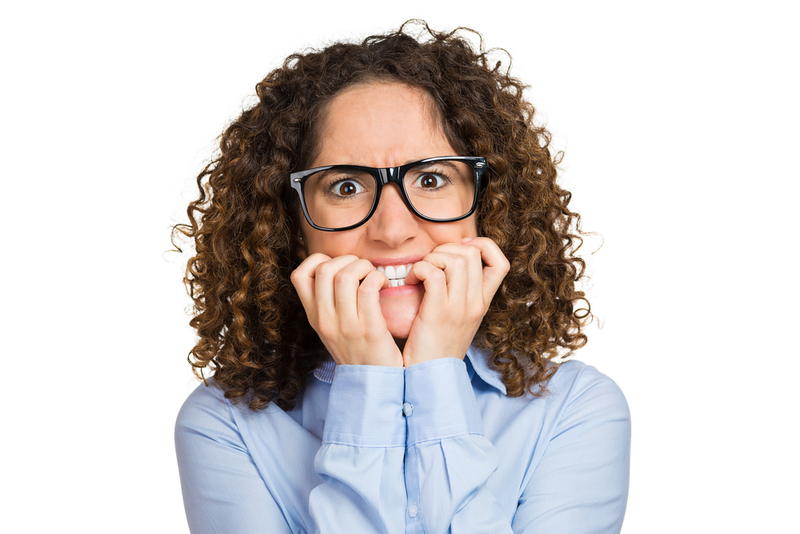 When it comes to nervousness, remember that it’s about managing them – not totally ridding yourself of them. Even the very best speakers in the world still get a little nervous right before they have to talk. Let this adrenaline rush work in your favor, so you can deliver a high-energy presentation! What are some ways you deal with stage fright? Share your tips below! Great article! I get very nervous before I speak! I am not one of the people that dread or have a fear of public speaking but my stomach is ALWAYS in knots before I utter the my first words. 2. Arrive early to get to familiar with the space and the audience! 2 things I will work on!